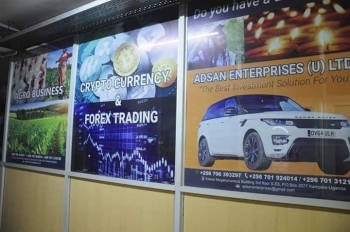 KAMPALA – Police in Katwe, have arrested two people, who were working with a multi-level marketing company Adsan Enterprises for allegedly defrauding unsuspecting people to the tune of Shs812 million and investing part of that money in cryptocurrency ventures. According to a statement released by police, the suspects who were running the company operating at Muganzirwazza Commercial Complex SE6 in Kampala are Simon Musinguzi and Daniel Kalyango. Police add that Adsan Enterprises started operating as a company that deals in supplying chicks to poultry farmers at a subsidized price with a solemn promise of a ready market after growth. The company proprietors duped clients into believing they had won some contracts into supplying dry food ratio and chicken to some Non-government organizations including United Nations High Commissioner for Refugees (UNHCR) and World Food Program (WFP) hence a ready and available market, the Police explained. Police was told by one of the suspects that the first months of doing business, things were a bit successful till the numbers of clients grew beyond the unexpected, hence channeling the money into different ventures like cryptocurrency, leaving their clients frustrated. The duo is currently detained at Katwe Police Station pending court on obtaining money by false pretense charges. This has days after central bank warned the public against investing in businesses which sound too good to be true also explaining that such dealings could be Ponzi or pyramid schemes. The BOU warned recently that if a business guarantees an investor high returns with little risks of losing the investment, it is false. “Money invested by clients is not invested in any legitimate business but used to pay the people operating the scheme as well as those who invested earlier on. This is why Ponzi schemes can sometimes appear to be genuine and profitable investments; because the people who invested first seem to be benefiting,” reads the statement. The Central Bank also said that if the proprietor running the business focuses all their energy into attracting new clients to make investments without a constant flow of new investments to continue to provide returns to the scheme owners and older investors, the scheme will fall apart. “If both old and new clients face difficulties trying to remove their money from the scheme, many times it has already been spent on paying the proprietors or other investors,” reads the statement. Elsewhere, the Police in Kisoro has recovered a four-month-old baby boy that was stolen on the July 12 this year vide SD 58/12/07/18 from the parents at Old Market, Northern Division in Kisoro Municipality/District. Police says he was recovered in Kyampisi Village, Kyabakade Parish, Nagalama in Mukono district on 26/08/18 by Shaban Ssemogerere, a crime preventer on a tip-off. Elly Maate Kigezi region Police spokesman confirmed the baby was found with a one Betty Murekatete, the very person who was suspected to have connived with a house-maid that escaped with it. “As much as the baby was found circumcised and given a Muslim name, it’s parents, Hallerimana Kalodi and Monica Dusabe received their son on Sunday while in good health,” Maate confirmed.